The Enûma Eliš (Akkadian Cuneiform: 𒂊𒉡𒈠𒂊𒇺, also spelled "Enuma Elish"), is the Babylonian creation myth (named after its opening words). It was recovered by Austen Henry Layard in 1849 (in fragmentary form) in the ruined Library of Ashurbanipal at Nineveh (Mosul, Iraq), and published by George Smith in 1876. The Enûma Eliš has about a thousand lines and is recorded in Old Babylonian on seven clay tablets, each holding between 115 and 170 lines of Sumero-Akkadian cuneiform script. Most of Tablet V has never been recovered but, aside from this lacuna, the text is almost complete. The Enûma Eliš exists in various copies from Babylon and Assyria. The version from Ashurbanipal's library dates to the 7th century BCE. The composition of the text probably dates to the bronze age, to the time of Hammurabi or perhaps the early Kassite era (roughly 18th to 16th centuries BCE), although some scholars favor a later date of c. 1100 BCE. When the seven tablets that contain this were first discovered, evidence indicated that it was used as a "ritual", meaning it was recited during a ceremony or celebration. That celebration is now thought to be the Akitu festival, or Babylonian new year. This tells of the creation of the world, and of Marduk's victory over Tiamat, and how it relates to him becoming king of the gods. This is then followed by an invocation to Marduk by his fifty names. The epic names two primeval gods: Apsû (or Abzu) who represents fresh water and Tiamat representing oceanic waters. Several other gods are created - Ea and his brothers - who reside in Tiamat's vast body. They make so much noise that the babel or noise annoys Tiamat and Apsû greatly. Apsû wishes to kill the young gods, but Tiamat disagrees. The vizier, Mummu, agrees with Apsû's plan to destroy them. Tiamat, in order to stop this from occurring, warns Ea (Nudimmud), the most powerful of the gods. Ea uses magic to put Apsû into a coma, then kills him, and shuts Mummu out. Ea then becomes the chief god, marries Damkina, and has a son, Marduk, greater still than Ea himself. Marduk is given wind to play with and he uses the wind to make dust storms and tornadoes. This disrupts Tiamat's great body and causes the gods still residing inside her to be unable to sleep. The gods persuade Tiamat to take revenge for the death of her husband, Apsû. Her power grows, and some of the gods join her. She creates 11 monsters (Bašmu, “Venomous Snake”; Ušumgallu, “Great Dragon”; Mušmaḫḫū, “Exalted Serpent”; Mušḫuššu, “Furious Snake”; Laḫmu, the “Hairy One”; Ugallu, the “Big Weather-Beast”; Uridimmu, “Mad Lion”; Girtablullû, “Scorpion-Man”; Umū dabrūtu, “Violent Storms”; Kulullû, “Fish-Man”; and Kusarikku, “Bull-Man”) to help her win the battle and elevates Kingu, her new husband, to "supreme dominion." A lengthy description of the other gods' inability to deal with the threat follows. Marduk offers to save the gods if he is appointed as their leader and allowed to remain so even after the threat passes. When the gods agree to Marduk's conditions he is selected as their champion against Tiamat, and becomes very powerful. Marduk challenges Tiamat to combat and destroys her. He then rips her corpse into two halves with which he fashions the earth and the skies. Marduk then creates the calendar, organizes the planets and stars, and regulates the moon, the sun, and weather. The gods who have pledged their allegiance to Tiamat are initially forced into labor in the service of the gods who sided with Marduk. But they are freed from these labors when Marduk then destroys Tiamat's husband, Kingu, and uses his blood to create humankind to do the work for the gods. 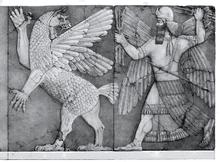 Most noteworthy is Marduk's symbolic elevation over Enlil, who was seen by earlier Mesopotamian civilizations as the king of the gods. The Enûma Eliš was recognized as being related to the Hebrew Genesis creation account from its first publication (Smith 1876). "In the beginning, God created the heavens and the earth. The earth was without form and void, and darkness was over the face of the deep. And the spirit of God was hovering over the face of the waters. And God said, ‘Let there be light,’ and there was light." Though most scholarly work on the Enûma Eliš regard its primary original purpose to be the elevation of Marduk, the chief god of Babylon, above other Mesopotamian gods, researchers seeking to remove Babylonian influence onto Judaism assert counter arguments. To address the similarities between the accounts, Christian apologist Conrad Hyers of the Princeton Theological Seminary, stated that the Genesis creation myth polemically addressed earlier Babylonian and other pagan creation myths to "repudiate the divinization of nature and the attendant myths of divine origins, divine conflict, and divine ascent," thus rejecting the idea that Genesis borrowed from or appropriated the form of the Enûma Eliš. According to this theory, the Enûma Eliš was comfortable using connections between the divine and inert matter, while the aim of Genesis was to state the superiority of the Israelite god Elohim over all creation (and subsequent deities). Th. R. Kämmerer - K. A. Metzler, Das babylonische Weltschöpfungsepos Enûma elîsch (= Alter Orient und Altes Testament. Bd. 375). Ugarit-Verlag, Münster 2012, ISBN 978-3-86835-036-4. Seven Tablets of Creation, Luzac's Semitic Text and Translation Series, No 12 & 13, ISBN 978-0-404-11344-5 (1973). D. D. Luckenbill, "The Ashur Version of the Seven Tablets of Creation," The American Journal of Semitic Languages and Literatures, Vol. 38, No. 1 (Oct., 1921), pp. 12–35 . Zecharia Sitchin Translation: As a Cosmology of the Solar System with the names of the gods as the Sumerian names of our 9 planets, with Tiamat (as old Earth), a 10th planet called Nibir (Marduk), our Sun, and Earths moon (Kingu). An intruder planet called Nibiru, enters the early Solar System making Uranus turn a 90 degree axis, pulled a moon of Saturn away becoming Pluto, then has a moon impact with Tiamat (old Earth) between Mars and Jupiter. Half of Tiamat becomes the Asteroid belt and Comets. The other half of Tiamat from a second impact is pushed to 3rd from the sun as new Earth keeping Tiamats old Moon (Kingu). Marduk now as Nibir is locked in a counter clockwise 3600 year orbit. From Sitchin's — The Lost Book Of Enki. This translation is an example of a work of pseudo-religion, and Sitchin himself is accused of not being a qualified language scholar. ↑ Bernard Frank Batto, Slaying the dragon: mythmaking in the biblical tradition, Westminster John Knox Press, 1992, ISBN 978-0-664-25353-0, p. 35. Foster, B.R. (1995). From Distant Days : Myths, Tales, and Poetry of Ancient Mesopotamia. vi. Bethesda, Md: CDL Press. p. 438. Bottéro, J. (2004). Religion in Ancient Mesopotamia. x. Chicago: University of Chicago Press. Jacobsen, T. (1976). The Treasures of Darkness : A History of Mesopotamian Religion. New Haven: Yale University Press. p. 273. 1 2 Conrad Hyers, "The Meaning of Creation: Genesis and Modern Science", John Knox, 1984. ↑ Pinches, T.G. (2003). "Sabbath (Babylonian)". In Hastings, James. Encyclopedia of Religion and Ethics. 20. Selbie, John A., contrib. Kessinger Publishing. pp. 889–891. ISBN 978-0-7661-3698-4. Retrieved 2009-03-17. Arvid S. Kapelrud, "The Mythological Features in Genesis Chapter I and the Author's Intentions," Vetus Testamentum (1974) (jstor link).